If the crowd ain't movin' the bass ain't groovin'!! at Music go Round in Aurora, CO. Please call for available day/times and to schedule a lesson. Cancellation Policy: Please try and give at least 24 hrs notice when cancelling. Habitual no show/cancellations will be dropped. I like to get my students comfortable on their instrument first, and then begin to focus on their individual interests. Learn how to play along with your favorite song or how to build your own bass lines. You'll also learn how to understand your instrument and make the appropriate adjustments. I love sharing my knowledge and passion for music with students of all ages and levels! instrument care and songs of their choice. Intermediate - students go deeper into more complex techniques (finger, slap, tap). Theory, multiple styles, reading, ear training, and writing notation/tablature. Advanced - players will focus on improvisation, composition, advanced technique (three finger slap, two hand tapping) and much, much more! Learn, Create, and Have FUN! 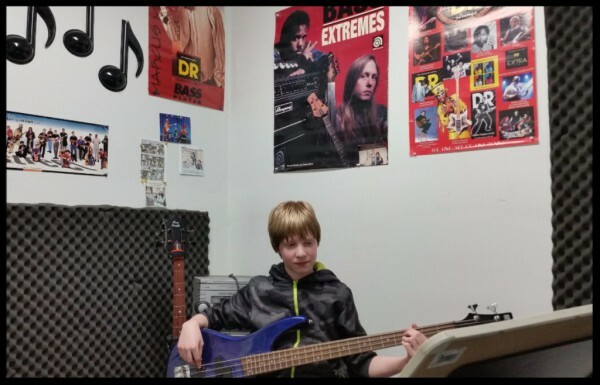 "My son and I really enjoy taking bass lessons from Steve. He works with you where you are at musically on the music you're interested in. He also makes it fun."